BioCycle recently published an article, "Environmental Impacts Of Packaging Options," by Oregon DEQ based on the Franklin Associates report, The Significance of Environmental Attributes as Indicators of the Life Cycle Environmental Impacts of Packaging and Food Service Ware from August, 2018. On March 6th, Franklin Associates offered a free webinar on openLCA – the free open source software for Life Cycle Assessment. The webinar was designed for students and practitioners familiar with LCA but who are interested in learning the capabilities of the openLCA software. It covered basic features of the software such as installation, downloading and using datasets, creating new flows and processes, and generating results. You can watch the webinar here (90 min). ERG was published in Environmental Science & Technology in collaboration with the National Energy Technology Lab and the University of Calgary. The article, "Expansion of the Petroleum Refinery Life Cycle Inventory Model to Support Characterization of a Full Suite of Commonly Tracked Impact Potentials" discusses the development of an expanded, open-source model for assessing air and water emissions from U.S. petroleum refineries, and is designed for life cycle assessment. The model is available at https://www.ucalgary.ca/lcaost/prelim. ERG Co-authors new publication, "Energy and greenhouse gas life cycle assessment and cost analysis of aerobic and anaerobic membrane bioreactor systems: Influence of scale, population density, climate, and methane recovery," in Bioresource Technology. ERG presented with EPA at a special session during AWWA's Sustainable Water Management Conference in Seattle March 27: Holistic Approaches Toward Sustainable Water Systems. ERG co-authored a conference paper for the 11th IWA International Conference on Water Reclamation and Reuse. The paper "Holistic Evaluation of Decentralized Water Reuse: LCA and Cost Analysis of Membrane Bioreactor Systems in Water Reuse Implementation" is available here. Interested in learning to use openLCA or growing your skills? Franklin Associates is co-hosting a training course with GreenDelta on September 30, 2016 in Charleston, South Carolina. More information is available here. Environmental Science & Technology recently published the paper, "Mining Available Data from the United States Environmental Protection Agency to Support Rapid Life Cycle Inventory Modeling of Chemical Manufacturing", authored by Sarah Cashman, as well as staff from U.S. EPA's National Risk Management Research Laboratory and a Postdoctoral Research Participant from Oak Ridge Institute of Science and Education (ORISE). This paper is available at http://pubs.acs.org/doi/abs/10.1021/acs.est.6b02160. Franklin recently conducted a peer-reviewed LCA for IFCO, a leading provider of reusable plastic containers worldwide. The study compared the environmental impacts of reusable plastic containers and corrugated boxes for shipping North American produce from farms to retail locations. Business Wire highlighted the study’s results in a recent press release. Journal of Industrial Ecology Publishes Franklin Associates' Peer-Reviewed Pine Chemicals Study. In November 2015, the Journal of Industrial Ecology published a peer-reviewed study developed by ERG on pine chemicals, which are co-products created during the papermaking process. These chemicals are used in products such as inks and adhesives, as well as in energy applications. ERG determined the cradle-to-gate carbon and energy footprint for pine chemicals, compared pine chemicals to their likely substitutes, and calculated the carbon and energy effects of shifting resources from current chemical production to biodiesel production. The study found that diverting pine chemicals into biofuel production in Europe will not significantly reduce carbon emissions or fossil fuel consumption. Franklin Associates was at the LCA XIV Conference this October 6th-8th in San Francisco! Bev Sauer (Session chair) and Sarah Cashman (presenter) represented Franklin Associates at this annual conference sponsored by the ACLCA. Comparative Life Cycle Assessment of Cooking Fuel Options in China and India. Guide for Sustainable Cookstove Fuel Production, Distribution and Use in Developing Countries. Introducing new staff members – Troy Hawkins and Ben Morelli. Franklin Associates welcomes Ben Morelli to our LCA staff! Franklin Associates welcomes Troy Hawkins to our LCA staff! Franklin Associates was at the LCA XIV Conference, October 6th-8th in San Francisco! 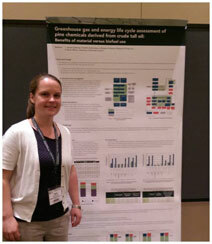 Franklin Associates is at the Green Chemistry Conference this June 17th-19th in D.C.
Franklin Associates' new study for the American Chemistry Council Pine Chemistry Panel presents the greenhouse gas and energy life cycle assessment of pine chemicals derived from crude tall oil and their substitutes (PDF). Click the link above to read the study's Executive Summary and visit http://pinechemistry.americanchemistry.com/ to learn more about the pine chemicals' industry. Jan. 2013 Franklin Associates' Presents at the University of Michigan's Sustainable Systems Forum: "Practicing LCA—Case Studies and Career Paths"
Nov. 2012 Franklin Associates' Beverly Sauer Authors Book Chapter "Life Cycle Inventory Modeling in Practice" in New "Life Cycle Assessment Handbook: A Guide for Environmentally Sustainable Products"
Janet is a 2012 graduate of the University of Michigan, where she completed a Master of Science in Natural Resources and Environment: Sustainable Systems and the Graduate Certificate Program in Industrial Ecology. We are very happy to have her join our LCA group! Oct. 2012 International Journal of Life Cycle Assessment Publishes Franklin Associates' Article "Comparative LCA of Treatment Options for US Scrap Tires: Material Recycling and Tire-derived Fuel Combustion"